We share a lot with our furry little friends. We give them love, they give us companionship. We give them shelter, they give us loyalty. We give them food, and they give us, uh, lots of different smells. Yes, our pets’ hygiene usually leaves much to be desired, but you don’t have to live with the many odors they bring into our lives. Here are 4 ways to fight pet odors and get rid of those unwanted olfactory offenses. Baking Soda: Baking soda is a great way to fight pet odors since it’s a natural smell absorber. If you have a smelly spot in your carpet or upholstery and the area is dry, try applying some baking soda. Make sure to adequately cover the area and let it sit for one to two hours. The odors should bind to the soda, and then all you have to do is vacuum it out. Vinegar: For spots that are still moist or wet, white vinegar is an easy option. After you’ve blotted up as much of the substance as possible, mix 1 part white vinegar and 3 parts water in a spray bottle. Spray generously (but don’t saturate the area!). Let it dwell for 10-15 minutes then blot up the remaining moisture. For large spots, repeat the process and extend the dwell time. Club Soda: Club soda is wonderful for drawing spots and odors to the surface of your carpet, upholstery, car seats, or anything made of fabric. Simply pour a mixture of 1 part club soda and 1 part water over the affected spot and immediately blot it up. Repeat as necessary. Coffee Grounds: Coffee grounds are another great odor absorber. If you’ve treated the spot with any of the above options and you still detect hints of eau de Fido in the air, leave containers of freshly-ground coffee beans in conspicuous areas near the “impact zone”. Make sure to keep them out of your pet’s reach, unless you want a caffeinated canine or kitty. Also, I wouldn’t use these grounds to brew coffee unless you are truly, utterly desperate for a caffeine fix. A Special Note on Bleach: Due to its chemical properties, bleach is an extremely powerful stain and odor remover, capable of neutralizing just about any smell it comes in contact with. 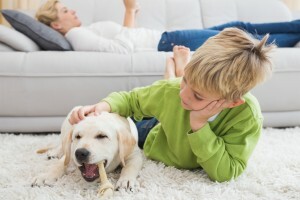 Unfortunately, using bleach to eliminate pet odors is a bit like burning your house down to get rid of a spider you saw once; sure, you’ll get rid of the spider, but your house will be irrevocably damaged in the process. NEVER use bleach on carpet or any kind of colored fabric! Bleach permanently lightens colors, and no amount of cleaning will help. YOU HAVE BEEN WARNED!!! With these tips in hand, you’ll be able to DIY most small pet odors with minimal effort. But not all pet accidents are created equal! Should the absolute worst happen (and before you turn to drastic measures like bleach), let the professionals at Modernistic take a look at your pet stains and odors. You’d be surprised at how Simple and Quick we can erase pet spots and smells!